This process requires you to know the existing PIN. If you have forgotten your PIN, see the Reset Forgotten PIN steps below. On your telephone, press the envelope button or dial *298. Press 4 to access the Personal Options menu. Press 4 to access the Personal Preferences menu. Press 1 to enter a new PIN. Enter a new four to eight-digit PIN and then press #. If you do not have access to your business account from the MyAccount portal, contact your administrator to change your voice mail PIN. Select My Services, then select Voice Mail Settings. 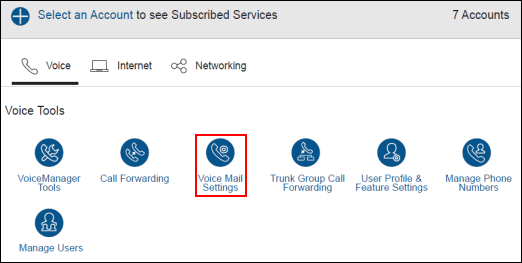 From the Voice Mail Settings page, select Mailbox PIN Code. In the New Voice Mailbox PIN field, enter a four to eight-digit number. The requirements for the PIN are explained on this page. In the Confirm New Voice Mailbox PIN field, re-enter the PIN.